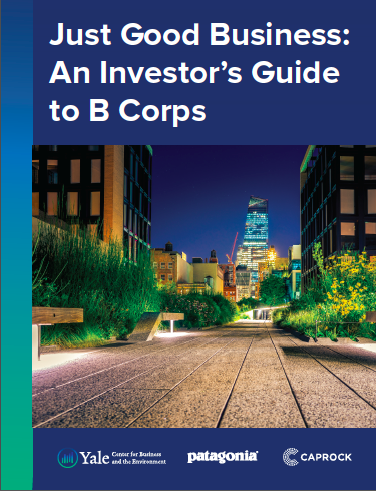 Whatever your interest in Certified B Corps—supporting the triple-bottom line, their strength as investments that bring a more comprehensive set of risks into focus—this guide delivers what investors need to know about Certified B Corps and Benefit Corporations. There is a profound shift underway in how capital markets value companies. So if you’re an investor, what do you need to know? In partnership with Patagonia and wealth advisory firm Caprock, the Yale Center for Business and the Environment has released a new publication to answer this question. Entitled “Just Good Business: An Investor’s Guide to B Corps,” this report explores the distinct financial value offered by Certified B Corporations and Benefit Corporations. "B" designations, created and overseen by the nonprofit B Lab, offer a certification program and legal framework by which companies can fold social and environmental impacts into their bottom line. The B Corp movement is, to me, a product of a general improvement in our understanding of economic behavior. Through greater appreciation of the real motives that drive and excite people, B Corporations provide a significant new opportunity for investors. I think they could make more profits than any other types of companies, and this guide helps investors understand why. Alex Buerkle holds an MBA from the Yale School of Management and a BA from Cornell University. She is passionate about utilizing business as a force for social and environmental good. While at Yale, she interned for JPMorgan Chase & Co., consulted for Hewlett Packard and a sustainable transportation startup, planned the first ever conference on the business of menstruation, and led a student trek on Scandinavian design. Prior to Yale, Alex made grant, debt, and equity investments in African businesses and social enterprises and served on the board of Net Impact NYC. Alex also brings experience in product development, organizational behavior research, and social sector consulting. She has been recognized as a StartingBloc Social Innovation Fellow, a Philanthropy New York Emerging Leader, a Forté Fellow, and a Yale Center for Customer Insights Fellow. Kylee Chang is a Master of Environmental Management candidate at the Yale School of Forestry and Environmental Studies. She is enthusiastic about providing investors and businesses with information and tools to properly address social and environmental issues. At Yale, she worked as a Research Assistant at the Center for Industrial Ecology. Before coming to Yale, Kylee interned at NASA and Chevron studying pollution from agricultural practices and oil refineries. She previously worked as a climate researcher studying urban air pollution, climate change in the Arctic, and ocean health; publishing her work in respected academic journals. She holds a BS in Chemistry from Loyola Marymount University and an MS in Earth Science from UC San Diego. Kylee enjoys surfing, yoga, and dancing Argentine tango. Max Storto is a Master of Environmental Management candidate at the Yale School of Forestry and Environmental Studies. At Yale, Max served as a Research Assistant for the Yale Initiative on Sustainable Finance. Before starting graduate school, he worked at Boston Common Asset Management, a socially responsible investment firm that integrates sustainability and human rights issues into its investment process (and a B Corp!) and at the Sustainable Endowments Institute, an NGO focused on financing energy-efficiency projects. He studied Environmental Science and Public Policy at Harvard University and loves backpacking, board games, and responsible supply chains. The Yale Center for Business and the Environment provides a platform for generating, incubating and launching innovative action at the intersection of business and the environment. The Center joins the strengths of two world-renowned graduate schools—the Yale School of Management and the Yale School of Forestry & Environmental Studies—together with an extensive network of internal and external thought leaders at the business- environment interface. Driven by student interest, we develop partnerships with a wide range of actors across Yale (students, faculty, staff) and in the professional world (alums, companies, NGOs, governments). Our work covers finance, entrepreneurship, marketing, operations, and strategy on issues involving energy, water, carbon, food, natural areas and society. Founded by Yvon Chouinard in 1973, Patagonia is an outdoor apparel company based in Ventura, California. A certified B-Corporation, Patagonia’s mission is to build the best product, cause no unnecessary harm, and use business to inspire and implement solutions to the environmental crisis. Since 1985, Patagonia has dedicated 1 percent of sales each year to environmental causes. The Caprock Group is a wealth advisory firm engineered for the 21st century, offering both an innovative approach to conventional investing as well as a market-leading platform in sustainable, responsible and impact investing. In so doing, Caprock blends deep investment experience with unconventional investment strategies to future-proof their client’s lives: re-thinking wealth from the ground up. Advising on over $3 billion in family, foundation and philanthropic capital, the firm features regularly in the world’s leading financial media, is a founding B Corp and is proud to have been honored as one of only three companies in the world to earn B Community “Best for the World” status in three categories: Employees, Customers and Changemakers. Tuesday October 16, 2018, 6:00 p.m. — 8:30 p.m.
Tuesday March 20, 2018, 7:00 p.m. — 9:00 p.m.